Autoreactive CD4+ T cells are an essential feature of type 1 diabetes mellitus. We applied single-cell TCR α- and β-chain sequencing to peripheral blood GAD65-specific CD4+ T cells, and TCR α-chain next-generation sequencing to bulk memory CD4+ T cells to provide insight into TCR diversity in autoimmune diabetes mellitus. TCRs obtained for 1650 GAD65-specific CD4+ T cells isolated from GAD65 proliferation assays and/or GAD65 557I tetramer staining in 6 patients and 10 islet autoantibody-positive children showed large diversity with 1003 different TCRs identified. TRAV and TRBV gene usage was broad, and the TRBV5.1 gene was most prominent within the GAD65 557I tetramer+ cells. Limited overlap (<5%) was observed between TCRs of GAD65-proliferating and GAD65 557I tetramer+ CD4+ T cells. Few TCRs were repeatedly found in GAD65-specific cells at different time points from individual patients, and none was seen in more than one subject. However, single chains were often shared between patients and used in combination with different second chains. Next-generation sequencing revealed a wide frequency range (<0.00001–1.62%) of TCR α-chains corresponding to GAD65-specific T cells. The findings support minor selection of genes and TCRs for GAD65-specific T cells, but fail to provide strong support for TCR-targeted therapies. Antigen-directed immune responses are a pathogenic feature of immune-mediated disorders including type 1 diabetes mellitus. Ag-specific T cells are usually identified with functional assays such as cell proliferation or MHC–peptide multimer binding assays (1). The specificity of the adaptive response is provided by Ag receptors. Diversity of the T cell Ag receptor is high and has been estimated to reach 1–5 × 106 distinct TCR β CDR3 chains (2, 3). Diversity results from combinatorial rearrangements of V, J, and, for TCR β, D gene segments. The resulting V-(D)-J sequence constitutes the hypervariable CDR3. The TCR CDR3 α and β loops provide the major contact point with the Ag peptide and determine Ag specificity (4). Detailed CDR3 nucleotide sequence information is, therefore, important for understanding the diversity of T cell responses and repertoire against a given Ag or peptide, and may permit follow-up of individual clones in a molecular fashion (5). Little is known of the TCR repertoire of autoantigen-responsive cells in type 1 diabetes mellitus. There are occasional reports of TCRs from islet-infiltrating cells and pancreatic lymph node cells in humans (6–8) and TCRs of islet- and Ag-responsive clones (9–12). In the NOD mouse, restriction and public character of the TCR β-chain repertoire for GAD65-specific clones and a highly restricted TCR α repertoire for islet-infiltrating T cells have been described (9). Relatively little is reported with respect to TCR diversity of islet autoantigen-specific T cells in humans. A biased TRBV usage for GAD65 557I tetramer+ cells has been reported (12), but TCR analysis is based on sequencing of rare clones. We have recently developed methods to sequence TCR α- and β-chains from single T cells and for deep sequencing of the TCR α-chain, which can be applied to study the TCR repertoire of Ag-specific T cells (13). Several methods have been described for the detection and isolation of islet autoantigen-specific CD4+ T cells in humans (14–16). We have reported that proliferative responses to whole Ag-stimulated memory CD4+ T cells are found in patients with type 1 diabetes and are rarely seen in control subjects (14). In contrast, Ag peptide tetramers have the advantage that they can identify CD4+ T cells that physically bind to a peptide–MHC complex (11, 12). In this study, we apply our TCR sequencing methods to GAD65-responsive and GAD65-binding CD4+ T cells isolated from patients with type 1 diabetes and children with pre–type 1 diabetes, to investigate the diversity and frequency of autoantigen-specific CD4+ T cells in type 1 diabetes. Samples used in this study were collected with informed consent from 6 patients with type 1 diabetes mellitus (median age, 19 y; range, 13–30 y) and 10 islet autoantibody-positive children (median age, 1.4 y; range, 1–4.8 y; Supplemental Table I). The subjects were selected on the basis of a positive CD4+ T cell response to GAD65 (stimulation index >3) in T cell proliferation response assays described later. Informed consent was obtained from patients, and the responsible ethics committee gave approval to the study. Three approaches were used to identify and isolate GAD65-specific CD4+ T cells. Samples from all 16 subjects were processed in a proliferation assay to obtain whole GAD65-responsive CD4+ T cells. Frozen CFSE-labeled PBMCs depleted of CD45RA+CD4+ T cells (105 CD4+ T cells/well; 1–10 wells for each condition) were cultured without or with 5 μg/ml GAD65 (Diamyd, Sweden) for 5 d as described previously (13). CFSEdimCD25+CD4+ T cells were identified by FACS (Fig. 1B) and sorted as single cells into 96-well PCR plates containing 5 μl PBS (prepared with diethylpyrocarbonate) H2O using Becton Dickinson FACSAria II flow cytometer with FACSDiva software and analyzed using FlowJo software version 7.6.1. Samples from three patients with type 1 diabetes mellitus (DM1, DM2, DM3) were processed to obtain GAD65 557I peptide-stimulated tetramer+ CD4+ T cells. Frozen or fresh PBMCs (5 × 106) were resuspended in 2 ml RPMI 1640 containing 2 mmol/l l-glutamine and 10% human serum (PAA Laboratories, Pasching, Austria) in 24-well plates and cultured with or without GAD65 557I(557I; NFIRMVISNPAAT) peptide (10 μg/ml equivalent to 0.007 nM; Proimmune, Oxford, U.K.) (17) for 14 d. Fresh medium plus IL-2 (40 U/ml) was added every 2–3 d from day 7 of culture. At day 14, cells were stained with 10 μg/ml GAD65 557I(557I; NFIRMVISNPAAT)-PE–labeled HLA-DRB1*0401 tetramer (Benaroya Research Institute, Seattle, WA) for 2 h at 37°C or HSV-PE–labeled HLA-DRB1*0401 tetramer (Benaroya Research Institute) as a negative control. Tetramer-stained cells were then stained for 30 min at 4°C with: anti-CD14 (clone M5E2) (BD Pharmingen), anti-CD16 (clone 3G8; BioLegend, San Diego, CA), anti-CD19 (clone HIB19; BD Pharmingen) and anti-CD56 (clone B159; BD Pharmingen)-allophycocyanin (gated on negative cells); anti–CD4-FITC (clone RPA-T4; BD Pharmingen; gated on positive cells), and anti–CD45RO-PE-Cy7 (clone UCHL1; BD Pharmingen). Dead cells and double cells were excluded using 7AAD (BD Pharmingen) for 10 min at room temperature, and 10 μM Hoechst 33342 (Invitrogen) for 20 min at room temperature. Cells were washed with PBS+1% human serum, and GAD65 tetramer+ CD45RO+ CD4+ cells (Fig. 1C) were sorted as single cells as described for whole GAD65-responsive cells. Samples from patient DM1 were processed to obtain GAD65 5571(557I; NFIRMVISNPAAT) ex vivo tetramer+ CD4+ T cells. CD4+ T lymphocytes were isolated by negative isolation using the MACS CD4+ Isolation Kit II (Miltenyi) and cultured overnight in RPMI 1640 (Life Technologies, Darmstadt, Germany) containing 2 mmol/l l-glutamine (BioWhittaker-Lonza), 5% human serum (PAA Laboratories), and 1/100 penicillin and streptomycin (BioWhittaker-Lonza) in a T-25 flask at 106 cells/ml. A total of 9 × 106 cells were then incubated with 50 nM Dasatinib (New England Biolabs) for 15 min and stained with 10 μg/ml GAD65 557I(557I; NFIRMVISNPAAT)-PE–labeled HLA-DRB1*0401 tetramer (Benaroya Research Institute) for 2 h at 37°C or empty PE-labeled HLA-DRB1*0401 tetramer (Benaroya Research Institute) as a negative control. Staining and sorting were performed as described for GAD65 peptide–stimulated tetramer+ CD4+ T cells and shown in Fig. 1D. RT-PCR amplification and sequencing of TCR α- and β-chains from single T cells, as well as subsequent cloning of PCR fragments, were performed as previously described (13). Analysis of TCR α and β sequences and Junction peptide amino acid sequence extraction was conducted with reference to the International ImMunoGeneTics Information System database (18). Obtained junction peptides were then analyzed using KNIME 2.9.4 (19). The TCR α repertoire of total CD4+CD45RO+ T cells was estimated using next-generation sequencing from four patients (DM1, DM4, DM5, DM6). For library preparation, RNA was isolated from 0.5 × 106 or 106 FACS-sorted CD4+CD45RO+ T cells directly frozen in RLT buffer + 10 μl/ml 2-ME using the RNeasy MiniKit (Qiagen, Hilden, Germany). First-strand cDNA was synthesized by a 5′ RACE (template switching) (20). In brief, RNA, 1 mM desoxyribonucleosidetriphosphate and 0.125 μM (final concentration) of 3′ primer binding to the TCR α C region (CregA3: 5′-CACTGTTGCTCTTGAAGTCC-3′) were denatured for 5 min at 65°C. A separate reaction mix containing 2.5 μM (final concentration) of the template switching Primer (Illumina_AdII_Internal_G-5′: 5′-GTGACTGGAGTTCAGACGTGTGCTCTTCCGATCTrGrGrG-3′), 2 mM DTT, 20 U rRNAsin (Promega, Madison, WI), 50 mM TrisHCl (pH 8), 187 mM KCl, 3 mM MnCl2, and 0.05% Tween 20 was added to make up a final volume of 20 μl. After preincubation (2 min at 42°C), 200 U SuperScript II Reverse Transcriptase (Invitrogen, Life Technologies) was added and the incubation was continued for 90 min at 42°C, followed by 15 min at 70°C. cDNA was purified using the MinElute PCR Purification Kit (Qiagen). Whole cDNA was amplified over 3 rounds of PCR with PrimeSTAR HS DNA Polymerase (TAKARA, Japan), allowing the addition of barcodes and adaptors for Illumina sequencing. Primers for the first round were: CregA1 (5′-TCGGTGAATAGGCAGACAGA-3′) and ILL_Part_internalAd2 (5′-GTGACTGGAGTTCAGACGTG-3′), for the second round: C-regA6-NNNNN-Ill-Ad1 (5′-ACACTCTTTCCCTACACGACGCTCTTCCGATCTNNNNNGCAGGGTCAGGGTTCTGGAT-3′) and Ill-Ad2-Barcode-index-internalAd2 (5′-CAAGCAGAAGACGGCATACGAGATindexGTGACTGGAGTTCAGAC-3′) and the last round Ill-singleRead-Amp1*Ad1 (5′-AATGATACGGCGACCACCGAGATCTACACTCTTTCCCTACAC-3′) and Ill-Ad2-Barcode index-internalAd2. Amplification was for 15, 12, and 25 rounds with the following cycling conditions: 1) 50 μl total (98°C 10 min, 56°C 7 min, 72°C 1 h 50 min), 2) 1 μl in 20 μl total (98°C 10 min, 49*°C 7 min, 72°C 1 h 50 min) (asterisk [*] represents 2°C increment per cycle starting at 49°C), and 3) 1 μl 1:100 in 50 μl total (98°C 10 min, 58°C 7 min, 72°C 1 h 50 min). The final product was purified with the PCR Purification Kit (Qiagen). Using the Illumina MiSeq and HiSEquation 2500 systems, we generated 150 bp reads. TCR CDR3 region sequences extraction and PCR error correction was carried out as described with MiTCR software (MiLaboratory, Moscow, Russia) (21). Nonproductive TCR sequences were filtered out, resulting in >70% usable reads. Statistical analysis was conducted using R (2.15.0 2012-03-30; The R Foundation for Statistical Computing, Vienna, Austria) and KNIME. TRAV and TRBV gene usage were compared using Fisher’s exact test for count data. Comparisons between read frequencies of shared clonotypes were done with the independent groups t test. In total, 19 samples from the 16 subjects were processed to obtain 3881 single-cell–sorted whole GAD65-responsive CD4+ T cells. High-quality α-chain sequences were obtained for 1767 (45.5%) cells, β-chain sequences for 2076 (53.3%) cells, and both chains for 1296 (33.4%) cells (Supplemental Table II). All TCR α and β CDR3 sequences can be accessed online at: http://www.crt-dresden.de/research/crtd-core-groups/bonifacio.html. The GAD65 Ag specificity of the TCR sequences is suggested by their TRAV and TRBV gene usage, which differs from that in nonresponding cells (p = 0.007 and p = 2 × 10−10) or tetanus toxoid–responding cells (p = 0.0001 and p = 0.004; Supplemental Fig. 1A, 1B) derived from the same patient (DM1). Although overall distribution differed, comparison of TRAV and TRBV gene usage in the GAD65-responsive and nonresponsive cells from patient DM1 found significant uncorrected increases only for TRBV2 (p = 0.016) and TRBV5.1 (p = 0.04). The most frequently used genes from all GAD65-responsive cells (all 16 subjects) were TRAV29/DV5 (9.9%) and TRAV26-1 (7.4%) and TRBV2 (8.7%) and TRBV28 (7.7%), but interindividual variation for some genes was observed (Supplemental Fig. 1C). Overall, there were 854 distinct TCRs from the whole GAD65-responsive CD4+ T cells, including 155 (18.1%) that were observed in more than one cell. The gene usage of the 155 TCRs observed in multiple cells was similar to that in all GAD65-responsive CD4+ cells (Supplemental Fig. 1C, 1E). The most represented TCR was seen in 23 cells from patient DM1. The findings suggest that there is profound diversity of TCRs in CD4+CD45RO+ T cells that proliferate during a 5-d culture with whole GAD65 Ag. 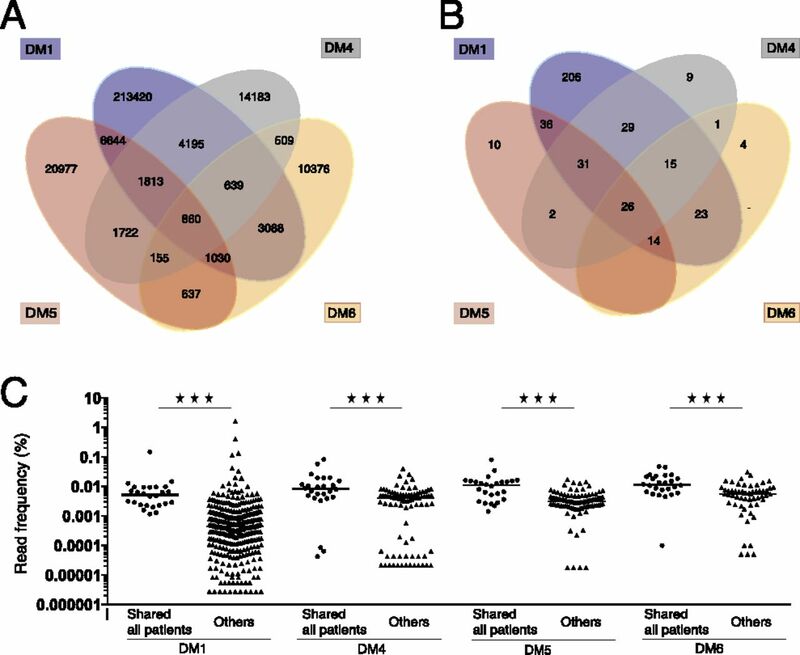 The ability to identify the same TCRs from multiple wells of the same sample and at different time points was assessed in patients DM1 (three time points) and DM2 (two time points; Fig. 1A). We identified 219 different TCRs in GAD65-responsive CD4+ T cells from patient DM1 and 104 from patient DM2. Of these, 25 (11.4%, patient DM1; Fig. 2A) and 7 (6.7%, patient DM2) were found in multiple wells of the stimulation assay, indicating that they could be repeatedly detected within a sample. In patient DM1, 17 (7.7%) of the 219 TCRs were observed at more than 1 time point and 5 of these at all 3 time points (Fig. 2). The TRAV and TRBV subgroup usage in these 17 was unremarkable, except for TRBV2, which was seen in 6 (35%) TCRs (Supplemental Table III). In patient DM2, only 1 (0.9%) TCR was found in whole GAD65-responsive CD4+ T cells from both time points. Isolation of GAD65-specific CD4+ T cells. (A) Schematic showing time after disease onset and between sequential samples (first row), cell type processed (second row), number of single cells processed for sequencing (third row), and sequencing success in obtaining TCR α and β sequence information (fourth row) in patients DM1 and DM2. (B) Representative FACS plots for isolation of whole GAD65-responsive CD4+ T cells. CD4+ T cells responses to medium (upper panel) or GAD65 whole Ag (lower panels) are shown. The gating for sorting single responding cells is shown: from CD4+CFSEdimCD25+ T cells (R1) a gate for single cell sorting of CD45RO+OX-40+ (R2) cells was applied. (C) Representative FACS plots for the isolation of GAD65 557I peptide–stimulated tetramer+ CD4+ T cells. GAD65 557I– (left plots) or, as a negative control, HSV-Tetramer (right plot)–stained CD4+ T cell responses to medium (top plot) or GAD65 557I peptide (lower plots) are shown. Gate (R1) shows cells that were sorted. (D) Representative FACS plot for the isolation of GAD65 557I ex vivo tetramer+ CD4+ T cells. The gate shows the cells sorted and the number shows the proportion from total CD4+ cells. TCR recovery in GAD65-responsive CD4+ T cells. (A) TCRs identified in GAD65 Ag-responsive CD4+ T cells (left), GAD65 557I peptide–responsive tetramer+ CD4+ T cells (middle), and ex vivo GAD65 557I tetramer+ CD4+ T cells (right) from multiple samples obtained postdiabetes mellitus onset in patient DM1. Only TCRs identified in multiple cells are shown. TCR nomenclature contains the Ag specificity (GAD or GAD557I), the patient identifier (DM1), and a number representing a TCR (as found on the sequence list: http://www.crt-dresden.de/research/crtd-core-groups/bonifacio.html). The number of assay wells containing the TCR in each of the samples is indicated in the grayscale (far left). The sample number refers to the time point of sampling shown in Fig. 1. GAD65-responsive refers to proliferating cells against whole GAD65 Ag; GAD65 557I responsive refers to tetramer+ GAD65 557I peptide expanded cells; and ex vivo GAD65 557I tetramer+ refers to tetramer+ cells that are directly isolated without stimulation and expansion. 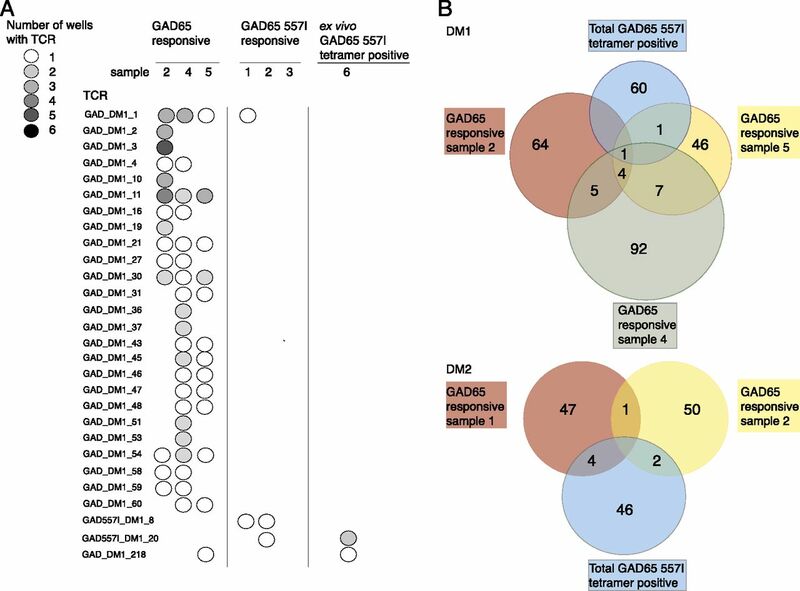 (B) Venn diagram of all TCRs of GAD65-responsive CD4+ T cells identified in samples from patients DM1 (upper panel) and DM2 (lower panel). Only TCRs where α- and β-chains have been found are shown. TCRs from the GAD65 Ag-responsive T cells are shown in red, yellow, and gray, and separately for the individual samples (as shown in Fig. 1) from which they were identified. TCRs from all GAD65 557I tetramer+ CD4+ T cells (both after peptide stimulation and ex vivo staining) are pooled and shown in blue. We next interrogated the CD4+ TCR repertoire against GAD65 557I peptide. Cells expanded by peptide and IL-2, and isolated by tetramer were examined in patients DM1, DM2, and DM3. A total of 35, 52, and 31 different TCRs were identified in patient DM1 (three time points), DM2 (2 time points), and DM3, respectively. GAD65 peptide–responsive TCRs were frequently seen in more than one cell isolated from individual patients (DM1, 25.7%; DM2, 40.3%; DM3, 35.4%). However, none of the TCRs was observed in multiple wells of an assay, suggesting that the cells were rare. One (2.8%) of the 35 TCRs (GAD557I_DM1_8) from patient DM1 was seen in more than one time point (Fig. 2A). None was seen in both samples from patient DM2. Unstimulated GAD65 557I ex vivo tetramer+ CD4+ T cells were examined in patient DM1. TCR sequencing of these cells (0.005% of total CD4+ T cells) identified 31 different TCRs from 32 cells with α- and β-chain sequence information. The TRBV5.1 gene was the most frequently used by all 149 GAD65 557I tetramer+ CD4+ TCRs (15.7%; Supplemental Fig. 1D). TCR sequences were obtained from CD4+ T cells proliferating against whole GAD65, peptide-stimulated tetramer+ CD4+ T cells, and ex vivo tetramer+ CD4+ T cells from patient DM1, providing the opportunity to search for overlap between the three methods (Fig. 2). Overlap was infrequent. One of the 35 peptide-responsive TCRs (GAD_DM1_1) was found in the whole GAD65-responsive CD4+ T cells. TCR GAD_DM1_20 was found in two ex vivo GAD65 557I tetramer+ CD4+ T cells and in one GAD65 557I peptide-stimulated tetramer+ CD4+ T cell. Finally, TCR GAD_DM1_218 was found in the ex vivo tetramer+ CD4+ T cells and in one whole GAD65-responsive CD4+ T cell. Overlap between the tetramer+ and GAD65-responsive cells was observed in six TCRs identified in patient DM2 (Fig. 2B). There was no overlap in patient DM3 (data not shown). We next examined the TCR α-chain repertoire in total CD4+CD45RO+ T cells by next-generation sequencing to determine the frequency of the GAD65-specifc TCRs. CD4+CD45RO+ T cells in patient DM1 yielded 36.6 × 106 reads mapping to TCR α. From these, 231,689 functional clonotypes, with read frequencies up to 1.62%, were identified (Fig. 3A). These included 130 (29%) of 449 that had been identified by TCR sequencing of GAD65-specific single cells from earlier samples (Fig. 3B). This overlap was less than the overlap for TCR α-chains of single-cell–sorted nonresponsive CD4+ T cells (48.3%; p = 0.0001) and single cell–sorted tetanus toxoid–responsive CD4+ T cells (46.5%; p = 0.006) in the same patient. Most of the GAD65-specific clonotypes were rare, with frequencies below 0.01% (1/10,000) in the next-generation sequencing reads (Fig. 3A). However, the most frequent clonotype (1.6%) was a TCR α clonotype seen in GAD65 ex vivo tetramer+ cells in this patient. GAD65-specific TCR α clonotypes in the total CD4+CD45RO+ T cell TCR α repertoire. (A) Read frequency distribution of the 231,689 functional TCR α clonotypes identified by next-generation sequencing of total CD4+ CD45RO+ T cells from patient DM1. The 130 TCR α clonotypes identified by TCR sequencing from GAD65-specific single cells are shown in red and all others are shown in black. A list of all TCR α sequences identified by next-generation sequencing can be obtained from the corresponding author. (B) Venn diagram showing overlap between the TCR α-chain repertoire obtained by next-generation sequencing of whole CD4+CD45RO+ T cells in patient DM1 (gray) and the TCR α-chain sequences identified in GAD65 Ag-responsive single CD4+ T cells (red), GAD65 557I peptide–responsive tetramer+ single CD4+ T cells, and ex vivo GAD65 557I tetramer+ single CD4+ T cells (yellow), tetanus toxoid–responsive single cell sorted CD4+ T cells (blue), and total (not selected by Ag) single-cell–sorted CD4+CD45RO+ T cells in patient DM1 (green). Both next-generation TCR α sequencing and TCR α-chain sequencing of GAD65-responsive single CD45RO+ CD4+ T cells were performed on the same blood sample for patients DM4, DM5, and DM6. We obtained 4.7, 5.7, and 2 × 106 reads, and 24,076, 33,838, and 17,294 TCR α clonotypes from next-generation sequencing in these patients. None of the three patients had prominent clonotypes as seen in patient DM1, the highest clonotypes taking up 0.4 (DM4), 0.19 (DM5), and 0.57% (DM6) of the reads. Of the TCR α-chains seen in the GAD65-responsive cells, 1 (11.1%), 3 (14.3%), and 1 (2.9%) were found, respectively, in the next-generation sequencing clonotypes for patients DM4, DM5, and DM6. All of these had read frequencies <0.01%. We next asked whether some of the TCRs of the GAD65-responsive cells were shared between subjects. None of the GAD65-specific TCRs (both α- and β-chain) was found in more than one subject, and none resembled those of previously published GAD- or islet-specific T cell clones (12, 22, 23). The CDR3 sequence of one GAD65-specific TCR β (CASSSGTVNTEAFF found in Infant 2) was previously described in an islet-infiltrating T cell clone of unknown Ag specificity (7), with different encoding TRBV genes (TRBV5-4 versus TRBV12-3). Despite the lack of complete TCR sharing between subjects, some TCR α-chains and some TCR β-chains were shared by multiple cells but with different accompanying chains (Table I). In one example (GAD Sα1), the α-chain of amino acid junction CILRDVWSNFGNEKLTF was found paired with the β-chain CASRKDSSGNTIYF (TCR GAD_DM1_1) in five GAD65-specific cells in patient DM1, and paired with different β-chains in two GAD65-specific cells from patient DM2, and one GAD65-responsive cell in an islet autoantibody-positive child (I4). Two additional cells shared this α-chain with unknown β-chains. We next compared TCR α clonotypes identified by next-generation sequencing between the four patients (Fig. 4A). A substantial portion of the TCR α-chains were identified in CD4+CD45RO+ T cells from more than one patient. Patient DM6 had the smallest data set, with 17,249 different TCR α clonotypes. Of these, 860 (5.0%) were found in all 4 patients and 6,058 (35.1%) were found in at least 1 other patient, suggesting widespread usage of TCR α clonotypes, similar to what is described for TCR β-chains (24–26). For each patient, the overall read frequencies of the 860 clonotypes shared by all four patients were higher than the read frequencies of the remaining clonotypes (p = 2.15 × 10−19 for DM1; p = 1.11 × 10−13 for DM4; p = 2.2 × 10−25 for DM5; p = 1.4 × 10−6 for DM6). Sharing of TCR α-chains. (A) Venn diagram showing sharing of all TCR α clonotypes obtained by next-generation sequencing of total CD4+CD45RO+ T cells in patients DM1, DM4, DM5, and DM6. (B) Venn diagram showing overlap between GAD65-specific TCR α clonotypes that had been identified by sequencing TCR α CDR3 regions from single GAD65-specific CD4+ T cells and next-generation sequence-derived clonotypes from total CD4+CD45RO+ T cells in patients DM1, DM4, DM5, and DM6. (C) Read frequency obtained by next-generation sequencing of total CD4+CD45RO+ T cells of the 26 GAD65-specific CD4+ T cell TCR α clonotypes common to patients DM1, DM4, DM5, and DM6 (circles) and the remaining GAD65-specific CD4+ T cell TCR α clonotypes (triangles) in the CD4+CD45RO+ T cell repertoires of patients DM1, DM4, DM5, and DM6. ***p < 0.0001. We also examined how many of the TCR α-chain clonotypes identified in the GAD65-specific CD4+ T cells from all the analyzed 16 subjects were found in the TCR α repertoires identified by next-generation sequencing (Fig. 4B). Of the total 1504 unique GAD65-specific TCR α clonotypes, 406 (26.9%) were recovered by next-generation sequencing. Again, several were identified in all 4 patients with next-generation sequencing data: 26 in all 4 repertoires and 151 in at least 2 repertoires. The 26 common GAD65-specific TCR α clonotypes had higher read frequencies than the remaining GAD65-specific TCR α clonotypes in each of the four repertoires (p < 0.0001 for each repertoire; Fig. 4C). We interrogated the TCR repertoire of peripheral blood GAD65 responsive and GAD65 557I peptide-binding CD4+ T cells from patients with type 1 diabetes mellitus and/or islet autoantibody-positive children. We found high diversity and little evidence of common GAD65-specific TCRs between patients. These findings are consistent with a broad circulating repertoire and minimal selection of potentially autoreactive CD4+ T cell clones during prediabetes mellitus, and are inconsistent with disease emerging from the expansion of few clones shared between patients. 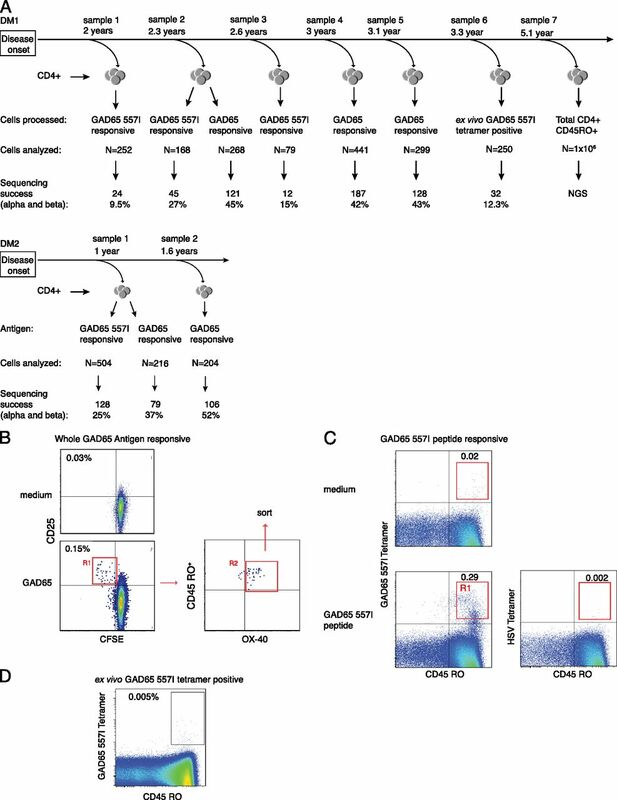 Several thousand circulating GAD65-specific CD4+ T cells were identified by their ability to proliferate in vitro against whole Ag, by their ability to proliferate to peptide and bind to a GAD65 peptide-HLA DRB1*0401 tetramer, or solely by their ability to bind to a GAD65 peptide-HLA DRB1*0401 tetramer. Although each of these methods has its limitations, all are used to quantify autoreactive T cells in patients (11, 14, 16, 27–29). Broad TCR repertoires were found in the GAD65-specific cells isolated with each of the three methods. Perhaps the most convincing finding with respect to diversity was that even the peptide-specific tetramer+ cells within a single patient were highly diverse and the same clones were rarely found in sequential samples taken from the same person. It is noted, however, that the very low frequency of peptide-specific tetramer+ cells (<0.05% in the samples studied) is an important technical limitation limiting the ability to find shared TCR sequences between patients, as well as between sequential samples of patients. Future attempts should consider using bead enrichment methods for the isolation of infrequent tetramer+ CD4+ T cells (30). Although our findings were consistent using several methods, there remain important limitations with respect to the specificity of the GAD65-responsive and GAD65 peptide–binding T cells. First, it is likely that the proliferating CD4+ CD45RO+ T cells include bystander responsive cells, thereby diluting the true GAD65-responder pool. We currently have limited means to distinguish the bystander and true GAD65 responder cells. We have, however, previously demonstrated that GAD65-responsive cells isolated by this method can specifically respond to Ag rechallenge (31). Isolating tetramer+ cells should increase the likelihood of retrieving bona-fide GAD65-specific T cells. However, it is possible that the tetramer has promiscuous binding because of weak binding affinities of autoreactive T cells. It is also noted that the tetramer has a modified peptide (11, 17). In this regard, it is possible that a more stringent gating strategy may have resulted in less diversity. It will be important, therefore, to validate the specificity of the GAD-specific TCRs by demonstrating Ag or peptide responses using cloned expressed TCR (28, 32). Finally, the purpose of our study was to examine TCR diversity in islet Ag-specific CD4+ T cells. As such, we only examined cells isolated from patients or children with islet autoantibodies. Thus, we do not claim that the TCRs we have identified are disease specific. We note, however, that we previously reported that GAD65-responsive CD4+CD45RO+ cells were not a feature seen in control subjects (14). A few studies have reported TCR gene usage for responses against type 1 diabetes mellitus autoantigens, and some have annotated TCRs from autoantigen-specific T cell clones (10, 16, 22, 29) and T cells infiltrating the pancreas (7). Some of these have suggested a restricted usage of TCR α or β genes, and the notion of public TCR for autoantigen has been put forward (9), raising the possibility that therapies can be directed against specific TCRs (33–35). Studies using tetramers with the GAD65 557I peptide reported a heavily biased TRAV and TRBV subgroup usage among T cell clones from different T1D patients (12, 36). In particular, the TRBV 5.1 subgroup has been identified. We also observed a preference for the TRBV 5.1 subgroup in the tetramer+ cells, but gene and TCR usage remained relatively broad. We did, however, observe sharing of single TCR chains between GAD65-specific CD4+ T cells within and between patients. Previous reports in the NOD mouse model of autoimmune diabetes mellitus have indicated a strong bias of the TCR α genes used in the autoimmune response to insulin (32). Our findings do not show the extreme bias in TCR α gene usage reported in that study, but support the notion that a single TCR chain may be critical in conferring autoantigen specificity. Of potential interest is the finding of one public GAD65-responsive β-chain sequence from our study and pancreas-infiltrating cells from a patient with type 1 diabetes mellitus (7). This study reinforces a number of limitations in methods used to identify and isolate CD4+ autoreactive T cells. The limited ability to retrieve the same T cell clones in sequential samples probably reflects the high diversity and low frequency of these cells and their time spent in circulation relative to lymphoid organs. We also found little overlap in TCRs isolated by tetramer and Ag stimulation. Tetramers are used to reduce artifacts of Ag stimulation assays and to offer the possibility to track peptide-specific T cells. However, for GAD65, the GAD65 557I peptide–responsive and binding CD4+ T cells appeared to be a very small set of the whole GAD65 Ag–responsive clones. Thus, a much larger set of tetramers will be required to monitor CD4+ T cells against single islet autoantigens. It was also noticeable that the vast majority of TCRs from tetramer+ cells were not found in the whole GAD65 Ag-responsive cells. This may simply reflect a very low precursor frequency of peptide-specific tetramer+ cells. However, it is also possible that this reflects promiscuous binding by the tetramer, poor presentation of the peptide on APCs, and/or a limited ability of tetramer+ cells to proliferate. We were able to assess next-generation sequencing methods for TCR clonotype identification currently pursued by several groups (3, 37, 38). We focused on TCR α sequences. Interestingly, frequencies of GAD65-specific TCR α clonotypes were as high as 1.6% in individual repertoires. However, the large majority of the GAD65-specific clonotypes were rare, and the majority of the GAD65-specific TCRs were not identified in the next-generation sequencing repertoires derived from 0.5–1 million memory CD4+ T cells. This is consistent with a low GAD-specific CD4+ T cell frequency in peripheral blood. Both single-cell TCR sequencing and next-generation TCR sequencing identified substantial sharing of TCR α-chains between patients, including sharing of TCR α-chains from the GAD65-specific CD4+ T cells. Importantly, we also note TCR α sharing with different β-chains (and vice versa) for GAD65-specific clones. This is similar to our previous findings in tetanus toxoid–responsive cells (13). The presence of the same α-chain or β-chain on multiple clones with different corresponding chains (and specificities) will not allow the identification of autoreactive clonotypes from measurements of single chains. Although only the TCR α-chain was analyzed by next-generation sequencing, these data suggest that the extent of this sharing is likely to be high. Moreover, we note a single example from our data in which an α-chain found on GAD65-responsive and tetramer+ CD4+ T cells from patient DM1 was observed at a frequency of 1.62% by deep sequencing. However, the actual total frequency of all the tetramer+ cells was <0.01% in the patient. We think it is unlikely that the tetramer quantification will have underestimated the frequency or the deep sequencing overestimated the frequency by such an extent, and therefore suggest that this α-chain is frequently used by T cell clones in this subject. Thus, we urge caution in the use of single TCR chain next-generation sequencing data or single TCR chain quantitative PCR methods (39) to measure frequencies of full TCRs of Ag-specific CD4+ T cells. Out study has provided insight into the diversity of autoreactive CD4+ T cells found in the peripheral blood in type 1 diabetes mellitus and pre–type 1 diabetes mellitus, and has identified a number of limitations in the use of novel technologies to monitor Ag-specific T cells. It should be stressed that the findings are limited to GAD65-specific CD4+ T cells and blood samples, and that diversity and clonal expansion may be more restricted against other autoantigens, in the autoreactive CD8+ T cell repertoire, and in the pancreas (40) or pancreatic lymph nodes. We note that preliminary findings suggest a similar level of diversity for proinsulin-responsive CD4+ T cells (A.E., unpublished data). It is also important that some of the proposed limitations are investigated with definitive studies. The findings are, however, inconsistent with the notion that single TCR families or clonotypes can be therapeutically targeted in type 1 diabetes mellitus and rather support the notion that numerous TCRs will be involved in the binding to single HLA class II–antigen autoantigen peptides (41). We are grateful to D. Walther, A. Borrmann, and N. Szydlowska (Center for Regenerative Therapies Dresden, Dresden University of Technology) for technical assistance. The work was supported by funds from the German Research Foundation Center for Regenerative Therapies Dresden (Cluster of Excellence [FZ 111]), the German Ministry of Research to the Competence Network Diabetes Mellitus, German Research Foundation/Collaborative Research Centers Grant SFB 655, and the German Center for Diabetes Mellitus Research, as well as by funds from iMed–the Helmholtz Initiative on Personalized Medicine. M.C. was enrolled in the Regenerative Medicine Ph.D. Program of the Dresden International Graduate School for Biomedicine and Bioengineering as part of the Dresden University of Technology.
. 2012. New tools for classification and monitoring of autoimmune diseases. Nat Rev Rheumatol 8: 317–328.
. 2009. Comprehensive assessment of T-cell receptor beta-chain diversity in alphabeta T cells. Blood 114: 4099–4107.
. 2011. Exhaustive T-cell repertoire sequencing of human peripheral blood samples reveals signatures of antigen selection and a directly measured repertoire size of at least 1 million clonotypes. Genome Res. 21: 790–797.
. 1996. The structure of the T cell antigen receptor. Annu. Rev. Immunol. 14: 563–590.
. 2006. Molecular strategies for detection and quantitation of clonal cytotoxic T-cell responses in aplastic anemia and myelodysplastic syndrome. Blood 108: 2632–2641.
. 2015. Proinsulin-specific, HLA-DQ8, and HLA-DQ8-transdimer-restricted CD4+ T cells infiltrate islets in type 1 diabetes. Diabetes 64: 172–182.
. 2011. TCR bias of in vivo expanded T cells in pancreatic islets and spleen at the onset in human type 1 diabetes. J. Immunol. 186: 3787–3797.
. 2005. Expanded T cells from pancreatic lymph nodes of type 1 diabetic subjects recognize an insulin epitope. Nature 435: 224–228.
. 2006. T cells to a dominant epitope of GAD65 express a public CDR3 motif. Int. Immunol. 18: 967–979.
. 1996. The T-cell receptor beta chain CDR3 region of BV8S1/BJ1S5 transcripts in type 1 diabetes. Immunogenetics 45: 87–96.
. 2002. 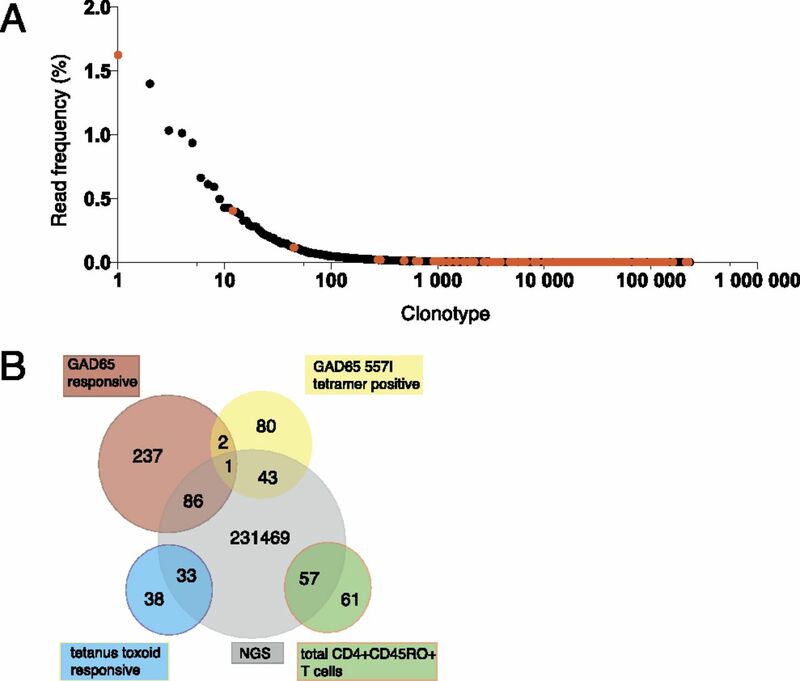 Detection of GAD65-specific T-cells by major histocompatibility complex class II tetramers in type 1 diabetic patients and at-risk subjects. Diabetes 51: 1375–1382.
. 2004. GAD65-specific CD4+ T-cells with high antigen avidity are prevalent in peripheral blood of patients with type 1 diabetes. Diabetes 53: 1987–1994.
. 2013. Measuring T cell receptor and T cell gene expression diversity in antigen-responsive human CD4+ T cells. J. Immunol. Methods 400-401: 13–22.
. 2007. Evidence for in vivo primed and expanded autoreactive T cells as a specific feature of patients with type 1 diabetes. J. Immunol. 179: 5785–5792. Mannering, S. I., F. S. Wong, I. Durinovic-Belló, B. Brooks-Worrell, T. I. Tree, C. M. Cilio, N. C. Schloot, R. Mallone; Immunology of Diabetes Society T-Cell Workshop Committee. 2010. Current approaches to measuring human islet-antigen specific T cell function in type 1 diabetes. Clin. Immunol. Exp. 162: 197–209.
. 2004. Molecular profile of the T cell receptors of regulatory and effector CD4+ T cells recognizing overlapping determinants on glutamic acid decarboxylase (524-543). Mol. Immunol. 40: 971–980.
. 2002. Modulation of T cell response to hGAD65 peptide epitopes. Tissue Antigens 59: 101–112.
. 2009. IMGT, the international ImMunoGeneTics information system. Nucleic Acids Res. 37: D1006–D1012.
. 2008. KNIME: the Konstanz information miner. In Data Analysis, Machine Learning and Applications: Proceedings of the 31st Annual Conference of the Gesellschaft für Klassifikation e.V., Albert-Ludwigs-Universität Freiburg, March 7–9, 2007. Preisach C., H. Burkhardt, L. Schmidt-Thieme, R. Decker, eds. Springer, Berlin, p. 319–326.
. 1999. Amplification of cDNA ends based on template-switching effect and step-out PCR. Nucleic Acids Res. 27: 1558–1560.
. 2013. Preparing unbiased T-cell receptor and antibody cDNA libraries for the deep next generation sequencing profiling. Front. Immunol. 4: 456.
. 2009. Restricted autoantigen recognition associated with deletional and adaptive regulatory mechanisms. J. Immunol. 183: 59–65.
. 1994. HLA-DQ-restricted, islet-specific T-cell clones of a type I diabetic patient. T-cell receptor sequence similarities to insulitis-inducing T-cells of nonobese diabetic mice. Diabetes 43: 1318–1325.
. 2010. Overlap and effective size of the human CD8+ T cell receptor repertoire. Sci. Transl. Med. 2: 47ra64.
. 2013. Huge overlap of individual TCR beta repertoires. Front. Immunol. 4: 466.
. 2011. A mechanism for TCR sharing between T cell subsets and individuals revealed by pyrosequencing. J. Immunol. 186: 4285–4294.
. 2010. Current approaches to measuring human islet-antigen specific T cell function in type 1 diabetes. Clin. Exp. Immunol. 162: 197–209.
. 1993. Antigen recognition properties of mutant V beta 3+ T cell receptors are consistent with an immunoglobulin-like structure for the receptor. J. Exp. Med. 177: 119–125.
. 2005. A peptide of glutamic acid decarboxylase 65 can recruit and expand a diabetogenic T cell clone, BDC2.5, in the pancreas. J. Immunol. 175: 3621–3627. 2012. MHC class II tetramers. J. Immunol. 188: 2477–2482.
. 2013. Activation of islet autoreactive naïve T cells in infants is influenced by homeostatic mechanisms and antigen-presenting capacity. Diabetes 62: 2059–2066.
. 2012. Germline TRAV5D-4 T-cell receptor sequence targets a primary insulin peptide of NOD mice. Diabetes 61: 857–865.
. 2011. Immune intervention in type 1 diabetes. Semin. Immunol. 23: 214–219.
. 2012. Prevention of type 1 diabetes in the rat with an allele-specific anti-T-cell receptor antibody: Vβ13 as a therapeutic target and biomarker. Diabetes 61: 1160–1168.
. 2012. Paradigm shift or shifting paradigm for type 1 diabetes. Diabetes 61: 976–978.
. 2010. A low antigen dose selectively promotes expansion of high-avidity autoreactive T cells with distinct phenotypic characteristics: a study of human autoreactive CD4+T cells specific for GAD65. Autoimmunity 43: 573–582.
. 2014. T cell repertoire following autologous stem cell transplantation for multiple sclerosis. J. Clin. Invest. 124: 1168–1172.
. 2013. Quantitative assessment of T cell repertoire recovery after hematopoietic stem cell transplantation. Nat. Med. 19: 372–377.
. 2014. Age-related decrease in TCR repertoire diversity measured with deep and normalized sequence profiling. J. Immunol. 192: 2689–2698.
. 2012. Demonstration of islet-autoreactive CD8 T cells in insulitic lesions from recent onset and long-term type 1 diabetes patients. J. Exp. Med. 209: 51–60.
. 2012. A single autoimmune T cell receptor recognizes more than a million different peptides. J. Biol. Chem. 287: 1168–1177.